We all love GPS because it gives us the exact way to get someplace we want to go. That is great and all but you really didn’t learn anything except that one way. To truly learn something you need to know about what not to do and the consequences that come with it. That is why I LOVE hearing about other people’s mistakes. With that in mind I wanted to write a different kind of post. 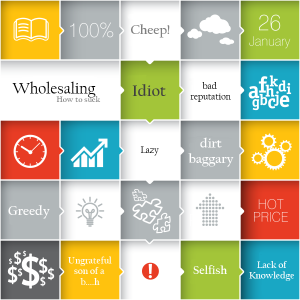 This post is all about how bad wholesalers think. I had fun writing this because I run into wholesalers who think like this all the time. Having Problems Wholesaling Real Estate…do you think this way?? I bought a list of leads from list source for $150. It’s a list of people in my target area…Texas. I’ve heard that all you have to do is send out some letters and your phone will be ringing off the hook with motivated sellers. Well I got calls but none of them seem to be motivated at all. I’m throwing this list out and going to try another list. 2 – Mr. Do I really want to be a wholesaler? This list I got was terrible dude. All the leads said they have already sold their property. Wtf! How can they houses be sold already? Why the heck did they call me last week then? I don’t know what is wrong. I sent out 5000 letters this month and only got 5 calls. All of them said something like…I was going to throw the mail out before opening it but thought it was a bill. Sorry, we are not interested in selling. Must be a bad list….next months results will be better for sure. I’m so afraid to answer my phone since my last mailing. I’ve gotten about six people yelling and threatening to press charges. Geez…some people just can’t take getting 5 letters in a two month period. So what if they asked to be taken off the list. Yo! I got this house under contract last week. The seller was so hard up…the husband left her for an older woman. She had two kids and also just lost her job. Said she had some money coming from a rich prince in Nigeria but it wasn’t coming in time to hold off foreclosure. I felt so bad for her and really wanted to help her out. My max offer was only $20k, but I offered 50k because I felt so sorry for her. I think I can break even on the wholesale if I find the right buyer. I saw this house yesterday and it was so unique. It had that old world charm…crown molding…high ceilings. I could see myself living there. It was such a nice house I had to get it under contract. I had to go above what my numbers said but I couldn’t take the risk of another investor outbidding me. I just had to have the house. That investor…John…has been snatching up deals all over town. I don’t know how he is able to offer so much for these properties. What ever it takes I’m going to get the next house, even if I have to overbid to get it. These deals…they are incredible! I can’t believe they were so easy to find. All I had to do was do a few searches on the MLS and they just jumped off the screen. I must really be an expert at finding these deals. I don’t know why everyone says that finding motivated sellers are hard…(a few days later)…Hmmm I wonder why none of my buyers are returning my phone calls. I told them they can find the details of the houses on MLS. They must not have gotten my emails, let me resend them. The other day I got this sweet deal from a guy I met on Bigger Pockets. He says he routinely finds distressed houses in his area and is looking for someone to give them to. I only made a couple thousand on this deal and to be honest he really didn’t do much. I could find these deals myself…easily! Maybe I’ll flip him a few bucks if he brings me another one….you know as a thank you. I got this phone call yesterday from the owner of a deal I was working on. He was pissed because he saw a craigslist ad advertising his house for sale…for a price higher then what we were discussing. He called the number on the ad and got my voice mail message. He said…”We’re done” and hung up. What they heck was that all about??? How am I going to resell the property if I don’t know what people would pay? Who knew this house was in a flood zone? I’m screwed!! No wonder why it was sitting on the market so long and the seller jumped at my offer. I’ll be lucky to get half my investment back on this one. I didn’t know that they were going to build a highway right behind that house in the next few years. Crap!! I can’t believe my top buyer only wants to give me 40k for this property. I got it for 35k but it’s a sweet deal! I told him I couldn’t let it go for anything less then 50k. He wouldn’t budge off his number so I decided to move on and contact a few other people…I’m going to get 50k if it kills me! It’s been 3 weeks and the closing date is only 7 days away. I called my “top buyer” back and offered it to him for 40k…he seemed to know I was being greedy the first time and he didn’t like that. He declined to take the deal. F*** now what am I going to do? It’s all a scam to just get your money. The title work always comes back clean anyhow so why should I waste my money? Heck I’m never on title so why should I care…my end buyer is the one who has to worry about this not me. Besides the seller can tell me if anything is owed. A great way to make money is to take other wholesaler’s deals and market them to my list. Don’t tell anyone but I markup the price by a couple thousand dollars. This way I get a bigger piece of the action. This works great except if one of my buyers is also on the other guys list…it really pisses them off. I lose a few buyers here and there because of this but there are plenty of fish in the sea. One of the best ways to wholesale a property that you paid to much for is to bring them to the REIA meetings and pass out flyers. You are sure to hook some “noob” rehabber who is all kinds of motivated to start. They are fools and a dime a dozen. What sort of wholesalers have you met that just make you shake your head? If folks would only lose the excuses, they would find that things finally begin to happen in their business. They just don’t want to do what it takes (#19). I couldn’t agree more Sharon! It’s an interesting exercise to take a step back and really be honest with yourself to see what YOUR excuses are. Sometimes you don’t even realize your making excuses for yourself. Happens to me all the time. Since I have done my own wholesaling, and kept the properties for rentals, I have not experienced some of the things you mentioned, but they do seem frustrating. I have found most of my deals due to knowing the area, and people know that I am actually looking to buy. Slow and steady, generating cash flow. The best way to find deals is certainly to know your target area like the back of your hand. Not only that but you can usually get the best deals. Thanks for chiming in! texas? when did you leave the nj market? lol…I was just making up scenarios for the most part. I’ve experienced some of these things in the past but not all of them. This is lots of fun, Scott. You covered just about “every crime in the book”. Most newcomers to wholesaling overlook entirely the need for a systematic Marketing Plan if they’re going to survive, let alone prosper, in the business. What they don’t get is they’re in the “marketing business” first of all; wholesaling is their (real estate-related) service. With such a plan in hand they wouldn’t be buying lists, sending out mailings or cold-calling prospective sellers or investors. Experienced marketers recognize there’s no shortage of wholesaling opportunities; it’s having a base of prospective sellers or referral sources and investors who have come to trust the wholesaler that will make or break the business. Without such a contact/prospect list all they have is an “opportunistic” business, going from one deal to the next in continuing Crisis Mode. Start with a marketing plan to build a prospect list, then stay in touch with that list. And don’t even think of picking up that first property (or contract rights) until you have at least 3 or 4 prequalified investor/buyers in hand. Then you have a business based on a plan and a system, not simple adrenaline and crisis management. Excellent points Philip! a wholesaler definitely needs a marketing plan. You can’t get away with anything less. For me it has always taken 6 months to really build momentum and keep it rolling. That can only happen if there is a plan in place and you follow threw. It is really easy to fall into this trap. The lore of the extra money is very very hard to get past. For me it’s all about being realistic and grounded in the idea that we are all trying to succeed. Building a good relationship with your buyer will pay off so much more then an extra 10k. Tell me about it…where are some people’s morals? Great material and advice on what NOT to do! Yes, there can be some dusche bags out there! You must be ethical and do on to others as you would like for others to do on to you. Always do good by the seller because lawsuits are never good and you’d be surprised how quickly word gets around… Don’t be greedy, don’t be ungrateful and don’t force the numbers for the sake if making a deal work! There will be others along, don’t set yourself up to lose money. Always be ready to walk away from a deal if need be! Most importantly, BE HONEST AND UP FRONT! Don’t pretend to be something you’r not. I want all of my motivated sellers to know that I am there to add value and provide an exit solution, but not necessarily buy the house myself… I want to disclose to them intend to take the problem off their hands by wholesaling their house to an end-buyer for a fee paid by the end-buyer. I will not attempt to come across as a direct buyer when I’m really not. If they are okay with the idea, then we can do business… Honesty and openness are always better. You sound like exactly the type of wholesaler I like to partner up with. Good job Javier! Great article and covered a ton. Hey Mason! How have you been? Those are excellent examples of the “Quick Fix Guy” where everything has to work the first time and with little effort or it doesn’t work. I needed a laugh and those people do exist. Sterring clear of these types. No time for that negativity. This is a great article, I will be sure to not make these mistakes as I get started.